Beginner Mini RC Drone Nano Quadcopter With 6 Axis By Teeny Drone! 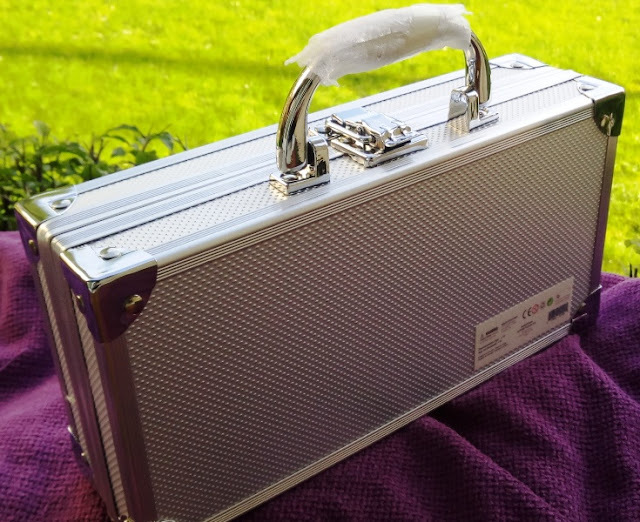 The Teeny Drone nano quad comes in a nice roadie aluminum briefcase along with an RC (remote control) transmitter, a charging USB cable, replacement drone propellers and replacement sticks for the remote control. 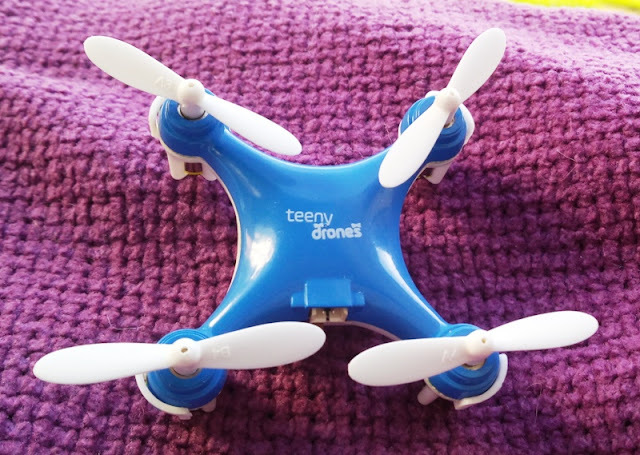 The Teeny Drone also comes with a very helpful instruction manual that explains how to fly the drone, how to do tricks, how to replace propellers, how to use the remote control functions. 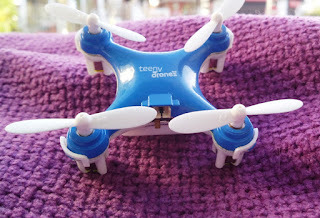 The Teeny Drone nano drone has a 3.7V 100mah battery, uses a 2.4Ghz frequency and 6-axis gyro system (made of gyros and accelerometers) that control yaw roll and pitch to level the Teeny Drone. 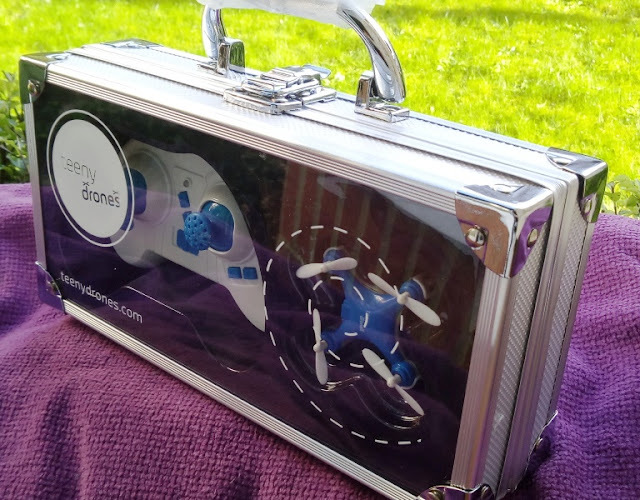 To get started flying the Teeny Drone, there is a specific startup procedure you must follow as the Teeny Drone has a built-in safety precaution to avoid the drone flying into your face should the throttle joystick were to be left raised up accidentally. First, turn on the Teeny Drone and then turn on the remote transmitter (you will hear two beeps). The LED lights will start flashing for a couple of seconds and then slowly stop flashing. When the LED lights stop flashing, move the left throttle joystick up and down and you're ready to go. The Teeny Drone itself has a total of four LEDs (two blue ones in the front and two red ones on the back). 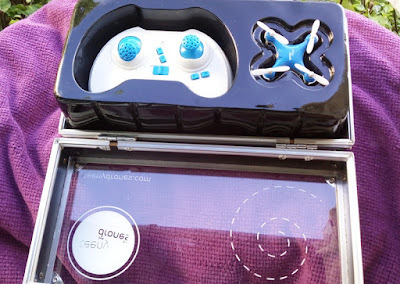 As far as the Teeny Drone remote controller, I really like its PS3 game controller feel to it and slightly bigger design than standard micro drone controllers, as it allows more precise movements and the location of the left and right shoulder bumpers make stunt flying way easier. The RC transmitter uses 2 x AA batteries. 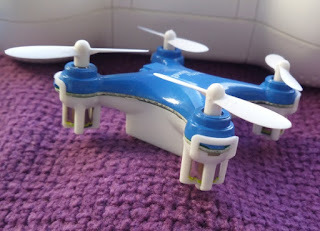 The left shoulder bumper controls the speed (you can switch between easy and fast); while the right shoulder one is the trick bumper, which allows you to flip the Teeny Drone in midair. 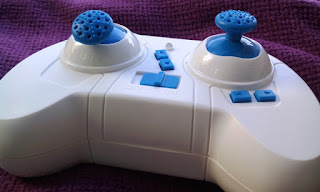 The left joystick controls the throttle and height, while the right joystick controls the forward/backward and right/left movements. 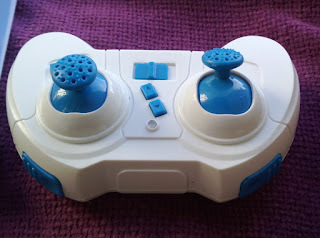 There also four small buttons on the Teeny Drone RC controller for the front/back and right/left motor adjustments. You can lift off the Teeny Drone nano quadcopter from almost any surface and land it anywhere, as well as do 360 degree flips and soar at high speeds (around 80 feet in the air). 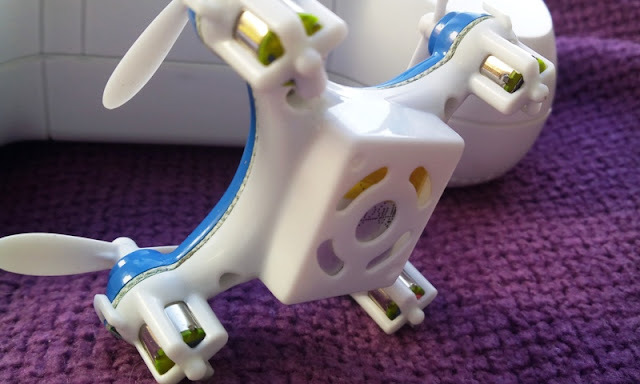 You can also hover the Teeny Drone in the exact same position for a very long time and it is also a crash-proof drone, which means you can crash the Teeny Drone into almost anything without it breaking, even when running it at full speed against a wall!